FX Photo Studio (Mac App Store link) is another entry in the increasingly competitive photo-manipulation software space for the Mac. Like Flare ( ) and Analog ( ), FX Photo Studio offers a slew of photo filters to artificially age, distort, or otherwise transform your photographs. And when I say “a slew,” boy do I mean it—FX Photo Studio packs in 172 effects. That’s well more than Analog and Flare offer combined. After launching the app, you choose a photo to work with. You can drag a photo into the program’s window or onto its Dock icon, import a photo using the built-in iPhoto-library browser, or choose a photo using OS X's standard Open dialog box. As is the case with the two competitors mentioned above, FX Photo Studio lets you open only a single photo at a time. Of course, filter quality matters more than quantity. In working with my own family photos, applying many of FX Photo Studio’s effects would never make sense. Some are glorified Photo Booth-style funhouse mirror effects; others blow out the colors more than I’d ever want. And with 172 filters to choose from, scrolling through the horizontal list of options can take some time. Luckily, a few features make that process less painful than it might otherwise be, and there are certainly some excellent effects to choose from. First, as you browse effects, each displays a live preview of the currently loaded photo, affording you a clear sense of what to expect if you apply that effect. But you can also (forgive me) filter the filters. A pop-up menu lets you choose whether the horizontal list includes all filters or just those that fall under one of FX Photo Studio’s 20 categories: Art, Black & White, Color Lenses, Color Strokes, Groovy Lo-Fi, and so on. You can also click the star underneath any filters to add it to the app’s Favorites section for quick access. You can also apply multiple effects to the same photo, and if you find a particular combination of effects especially pleasing—say, Conley mixed with Derby—you can save (and share) the combination as a preset. For each effect you apply, you can adjust various effect-specific qualities. Some effects—Explosion among them—allow you to click the place in your photograph where you’d like the effect to be centered. Other effects, like the black-and-white filter Dixon, let you adjust the contrast. Still others will let you tweak brightness, effect intensity, color, and such, using simple slider controls. More powerfully, FX Photo Studio allows you to draw a mask of your image, so that you can dictate precisely which sections of your photo should and should not be affected by the filters you apply. The mask controls are impressively easy to use. A photo (left) processed with one of FX Photo Studio's low-fi filters (right). Disappointingly, when you make adjustments to your photo or to the effects you apply to it, the preview doesn’t update in real time—for example as you drag a slider. The preview updates only after you finish making the change. The software’s pretty quick, so this isn’t a huge deal, but finer-grained control would be considerably easier if FX Photo Studio offered live previews. Once you’re content with your transmogrified photo, you can save it (in JPEG, JPEG-2000, OpenEXR, PNG, or TIFF format); email it; or share it to Facebook, Twitter, Flickr, or Tumblr. Unfortunately, FX Photo Studio doesn’t offer any option to name or caption your photo (or, for Facebook and Flickr, a way to choose the destination album), so you'll likely end up tweaking such metadata after your image is uploaded. 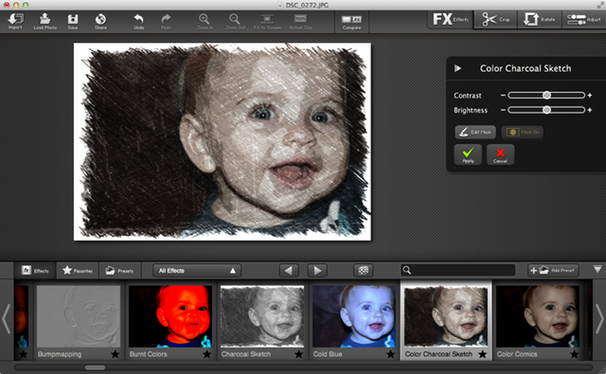 Limitations aside, FX Photo Studio blends a fun feature set with impressive power. You probably don’t need over 170 effects to apply to your photos, but it’s certainly nice to have options.